Ron Cembrowski takes us back to the 2012 Canadian Forces Day and Air Show at CFB Borden, Ontario, Canada. All photos by author. Canadian Forces Base Borden is located in Simcoe County, approximately 30 km west of Barrie, Ontario and 100 kilometres north of Toronto, Ontario. It is the historic birthplace of the Royal Canadian Air Force (RCAF). The base employs over 3,000 military personnel and over 1,500 civilians and is the training location for several elements of the Canadian Forces. CFB Borden also hosts a number of Lodger Units. They are located on the base, but do not report to the same higher formation command as CFB Borden. Amongst these Lodger Units are 16 Wing Borden, which provides technical training and personnel development to air force personnel, and 400 Tactical Helicopter Squadron equipped with CH-146 Griffon helicopters. The squadron reports to 1 Wing (Kingston). Borden no longer has operational runways and only a small section of Runway 05/23 remains, with a helicopter pad at the easternmost end. As a result, aircraft appearing at the Borden air show stage out of Lake Simcoe Regional Airport (CYLS). The airport is located approximately 50 km east of CFB Borden. The 2012 Canadian Forces Day and Air Show commemorated the 200th anniversary of the War of 1812 and the 68th anniversary of D-Day. In addition to the flying demonstrations, there were numerous interesting displays and events which served to highlight the military's capabilities, including the training activities provided at Borden. The air show was held on Saturday, June 9, and Sunday, June 10. The flying display started at about 1:00 PM and ran until 5:00 PM. The photos in this report are from the Media Day activities at Lake Simcoe Regional Airport, held on the Thursday and Friday before the air show weekend, as well as photos from the Sunday show. The media days provided some excellent opportunities to photograph the arriving air show participants, including the Canadian Forces Snowbirds, the CF-18 Demonstration Team Hornet piloted by Capt. Patrick "Paco" Gobeil, and the Demo Team back-up Hornet. 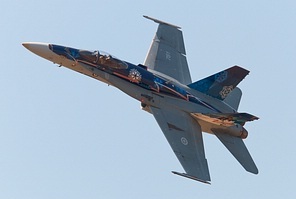 The 2012 Demo CF-18 special paint scheme was titled "The True North Strong and Free" and just as in the Canadian National Anthem it speaks to the magnificence of Canada's North. Unique to the 2012 design is a collection of 13 individual snowflakes, the number signifying the ten provinces and three territories of Canada. Each snowflake provides an artistic representation of the Canadian North. Other arrivals included the F-86 Sabre Mk5 and P-40N ("Stocky" Edwards) Kittyhawk from Vintage Wings of Canada (VWoC) in Gatineau Quebec. RCAF arrivals included a CC-130J Hercules from 436 Squadron (Trenton) and a CH-146 Griffon helicopter from 400 Squadron (Borden). An always welcome sight was the beautifully painted CT-133 "Mako Shark" in a replica colour scheme that originally appeared on a VU-32 squadron CT-133 for their squadron disbandment in 1992. The Mako Shark T-bird is an ex-Canadian Forces aircraft and is privately owned. Sunday was one of those classic hot and hazy air show days and while I always prefer it a bit cooler I'll never complain when there's no rain! Between the ground displays and the flying there is always something for everyone. There's ample space along the flight line for viewing the show, however you do need at least a 300mm lens to get decent photos as the show line is a fair distance away. 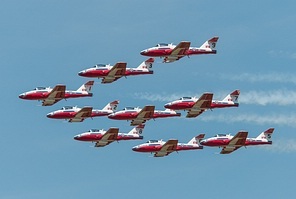 Borden normally holds a Canadian Forces Day and Air Show every two years, however in May of 2014 it was announced that the June show would be cancelled. The base announced that it would be focusing on a significant event for 2016 in celebration of the 100th anniversary of the base. Thanks to CFB Borden Public Affairs.